Santa needs your help! In this game you are going to make a lot of presents and do this Christmas amazing! Well, you can really cope with it. Just use all the tips and you will really love the game. Just have faith in yourself. Wow! Christmas is coming and you are in-charge of the presents that will be delivered by Santa, that is why you need to make sure you'll meet the demands and in the same time expand your workplace. 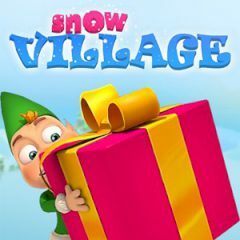 So, be ready to build buildings, shops and establishment that will benefit you Snow Village! Just imagine that you're on a long road trip during winter and just as you reach a small village, your car runs out of fuel. Just in order to continue on your road trip you'll need to find some fuel in this village. You will be the real wizard!